Much of our conversations about charts are about how charts help make our teaching visible so our students understand and use what we are teaching. Developing student independence is a constant pursuit. In other words, charts are for the kids. Right? Of course. Who else would they be for? Administration? Parents? Classroom visitors? Yes, yes, and yes. But as we have been busy launching units, planning and delivering lessons, reflecting on what is working, what is not, we have come to realize that the person the charts are most helpful for is the teacher. Yes, the teacher. And this is why. A teacher’s plate is always overflowing with stuff to do, deadlines to meet, paperwork to complete. Weekends are spent planning lessons for the week ahead. It is enough to keep anyone’s head spinning. So to keep from becoming dizzy, we suggest planning the chart simultaneously with planning your teaching as a way to maintain focus and clarity. Here is a case in point. Marjorie has been working with teachers in Van Buren, Arkansas (hello Central and Tate K, 1, 2 teachers! ), PS 192 in Brooklyn, and North Shore Long Island (Glenwood Landing) to find ways to help children synthesize their reading and to increase their conversational skills. The challenge was how to plan a lesson that would get children to say more about their books than just what was already stated in the book or just presenting a one-sentence idea like it was a fact carved in stone. After many minutes staring off into space (and a trip or two to the refrigerator) Marjorie started to think, “What might a chart look like that might help kids know what I am trying to teach them?” Thinking about the key characteristics of a good chart made the planning process much easier and helped smooth the way. …then choose the heading that you think will grab your students attention and help make your teaching memorable. 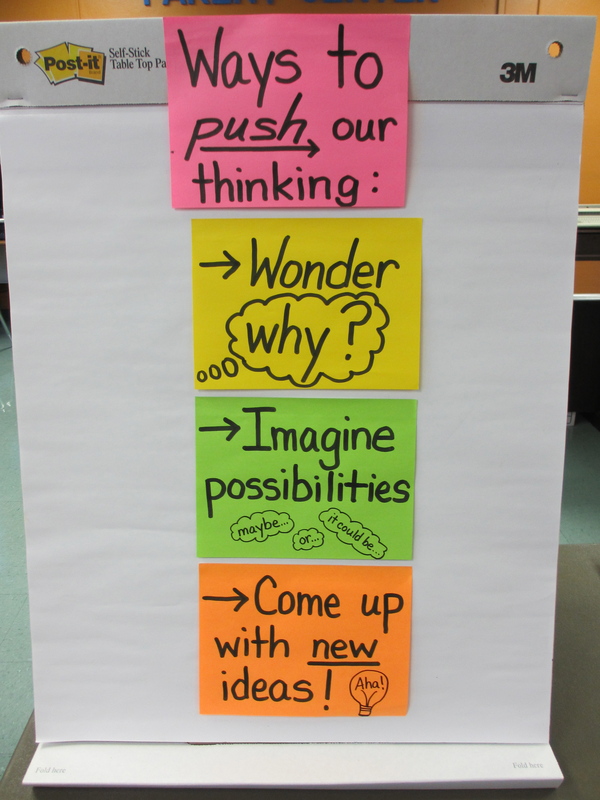 Marjorie chose to go with a statement because of the strong verb “push” which was what she wanted to challenge the kids to do—to push their thinking. It was also very visual—forces pushing forward. Thinking about the type of chart you need is also helpful in clarifying what you want to teach. Ask yourself, am I teaching a routine, a skill with strategies, a process, showing an exemplar, or teaching about a genre? This leads to thinking about whether you are teaching something that requires steps or items to choose based on need. Or do you want some kind of model students can use to guide them. In the case of the “Ways to push your thinking” chart, Marjorie decided she was actually teaching a process that would eventually lead to the skill of synthesizing. Knowing that a process chart might work lead to imagining some clear simple steps: first ask questions about your idea, then imagine possible reasons, then try to come up with some new ideas. Now, what words to use? Do you want to introduce certain vocabulary or use known words. Will you use these words in phrases, sentences, or as labels? Then consider how you plan to use the words. If you want to repeat these words over and over so that the children begin to chant them, then short phrases might be best. In this case, a lot of prompting would be needed so short phrases were decided upon. 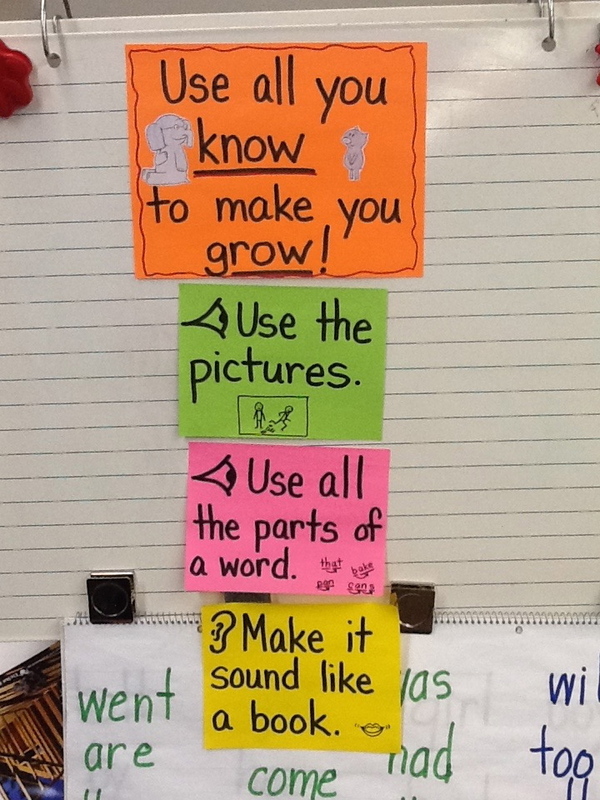 Each post-it helped to reinforce what the teacher was saying and teaching. This was also a chart that was used across the day, during the read aloud, reading workshop, social studies, and science because it was a big, huge idea that the teacher knew would need lots of practice to become a way of thinking. It was simple, accessible, and do-able. And for the teacher it took a complex idea, synthesis, and helped make it crystal clear to both teacher and students alike. Here are a couple more charts that helped the teacher plan lessons that were explicit and clear. 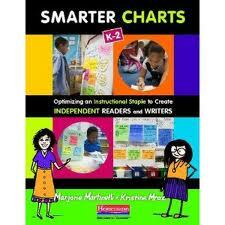 The charts also made the planning easier and kept the teacher focused as she implemented the lessons. 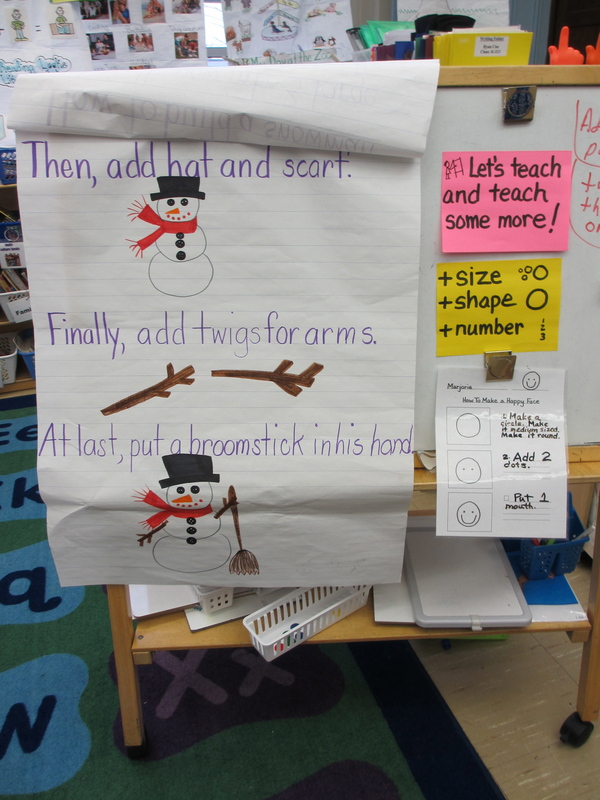 This chart uses a reminder heading, rhyme, and some favorite characters to grab kids’ attention. The goal was to teach some strategies for elaboration. The shared writing text on the left allows many opportunities for kids to practice the strategies. Using charts as a planning tool, no matter what the subject, will help make planning simpler and more effective because it will help you, the teacher, focus and help keep your main goals always in sight. So perhaps the chart does come before the teaching. Let us know what you think. I have switched to kinderarten this year after being in pre k a couple of years. I hated all the chart business that my administration wanted. I kept thinking, really in K. But push came to shove and i had to really look deep as how to make all that they want to be kid user and not jus to make them happy. I am happy to report i have been successful and with your help i have been able to take it one step further. Keep up the great work and keep sharing poster and charts tha work and are kid friendly! !